Atlanta United set a pair of attendance records Sunday but failed to secure a first-round bye in the playoffs when Sebastian Giovinco scored on a brilliant free kick in the 84th minute, giving Toronto FC a 2-2 tie and the most points ever in a Major League Soccer season. Toronto FC set a Major League Soccer points record. Having already clinched the Supporters' Shield and a first-round playoff bye, Toronto (20-5-9) reached 69 points on the final day of the regular season. That edged the previous MLS record of 68 set by the Los Angeles Galaxy in 1998. "It's rare for an MLS team to go through a season and not hit a down point," Atlanta defender Michael Parkhurst said. "They just didn't." A crowd of 71,874 packed Mercedes-Benz Stadium, eclipsing Atlanta United's previous single-game record of 70,425 for a September match against Orlando City. The expansion team also set a season record with an average of 48,200 a game, easily breaking the mark of 44,247 set two years ago by MLS' flagship franchise in Seattle. "It's very impressive that in just one year we could get to this point," United midfielder Kevin Kratz said. For the first — and only — time during this MLS season, the retractable roof on the new $1.5 billion stadium was open for a warm, cloudy afternoon. Because of lingering problems with the camera lens-like structure, it will remain closed at least through the rest of this year and into early 2018. Atlanta was in position to secure a first-round playoff bye when Josef Martinez scored his 19th goal in the 74th minute with a right-footed shot in front of the net off a pass from Hector Villalba. A victory would have pushed United to second in the Eastern Conference — good enough to avoid the single-game knockout round. But Giovinco, with a set piece from just outside the penalty area, launched the ball over the wall, caught the bottom of the crossbar and slipped it past leaping goalkeeper Brad Guzan. Instead of advancing straight to the second round, Atlanta (15-9-10) will host Columbus in an elimination game either Wednesday or Thursday. "It was so tight at the end with points and games, it seemed like it could have swung either way," Atlanta's Jeff Larentowicz said. "But we feel good going into the playoffs." Toronto rallied twice from one-goal deficits. After a video review showed a handball on Toronto's Drew Moor in the area, Atlanta was awarded a penalty kick. Yamil Asad converted in the 31st minute , giving United a 1-0 halftime lead. Jozy Altidore tied it up in the 60th minute. Moor won the ball in midfield and passed ahead to his Altidore, who outdueled Michael Parkhurst for possession and flicked a shot past Guzan to end the Atlanta keeper's shutout streak at 542 minutes. Guzan had posted five straight clean sheets, the longest scoreless streak in MLS this season and 10th longest in league history. United got a boost from the return of star midfielder Miguel Almiron, who entered in the 61st after missing four games with a hamstring injury. He orchestrated the play that led to Martinez's goal. 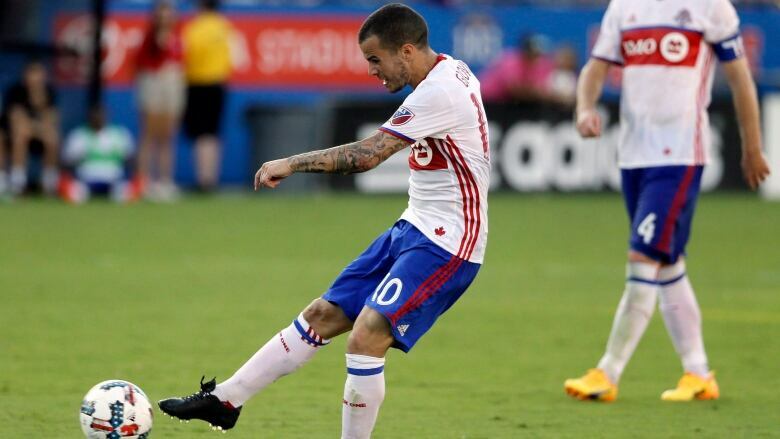 Giovinco's pinpoint shot silenced the raucous crowd. "That was probably the only place it could go in," Guzan said with a shrug. "That's why he's a world-class player. He's got that ability."